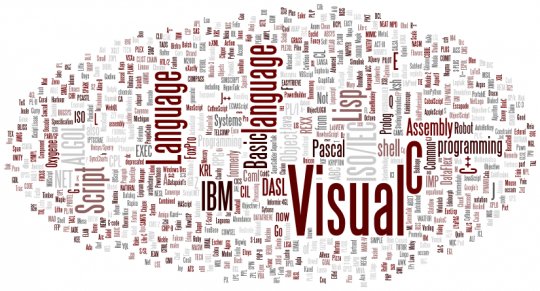 All popular programming languages, for each one the description and why to choose it. 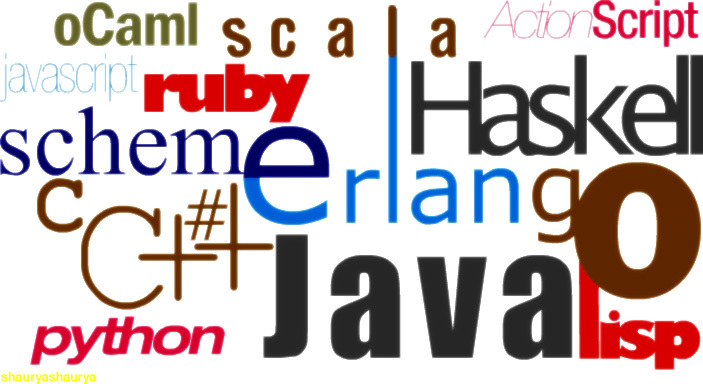 New emerging programming languages are also included in the list. (C Sharp) Concurrent to java, runs on .NET or compatible platforms (Portable NET, Mono). More – Code Easier than C++. May share resources with other languages under a common runtime. C C offers great freedom, and lot of debugging challenge thanks to pointers and memory management. More – Code Suffering slow programming to make fast programs. For system programming. C++ C++ is C plus objects, an extended library, templates. More – Code System programming as C but allow larger project, or applications. D language C++ like language, more dynamic. Compatible with C.
D Language – Code For teaching or scripting. Pascal Old language (1970), improved with objects, imposes a strictly structured programming. More – Code Teaching, or client/server apps with Delphi and Kylix. ASP This very old language (1964) was improved by Microsoft, with a complete programming environment. Other portages exist. More – Code Standard language for scripting Microsoft’s applications (Word etc…), and for dynamic web pages (Asp) on Windows servers. PHP Designed to be embedded inside HTML to build dynamic Web pages or update them from databases. More – Code Producing HTML pages from data. The version 5 targets Web services. Java Was designed to be portable and to replace C++. More – Code Cross-platform applications. For web services and mobile phone apps under Android. More – Code For interactivity in web pages and applications. Used with HTML 5 for Web or local apps on Metro or Node.js or Qt. Scriptol A simple, object-oriented, universal language with an intuitive and powerful syntax. You can build executables, or embed code into html pages. XML may be used as data structure. More – Code Easy and universal for scripting, prototyping, making binary applications, dynamic web pages and XML processing. For web services by using PHP 5 as back-end. Python A modern interpreted language with powerful built-in features and a unique indentation feature to shorten coding. The Jython version compiles in Java bytecode. More – Code Programming at light speed. Powerful and easy to learn. Extending Zope for web services. Only for open source applications (not compiled). Boo This is a new version of Python with some new features. It runs on .Net and Mono and thus, no compatibility problem. Boo – Code Similar to Python. ASP Scripting language, server-side, for dynamic web pages by Microsoft, same syntax as Basic. ASP – Code Producing HTML pages from data, but under Windows servers only. Assembler This is near the machine language and the fastest. You should never use it, as older programmers did. Making graphic subroutines, drivers or industrial processing. Eiffel, Sather Object-oriented, with “programming per contract” and other secure features. Sather is an open source implementation. More – Code Programming secured applications. Used by hospitals. Perl A scripting interpreted language. Readabillity and ease of use are not the goal. Perl – Code Mainly used by networks administrators and for small CGI scripts. Rebol Interpreted language for network scripting. The language itself may be augmented. Rebol – Code Processing information on distributed computer systems, with small programs. Ruby Designed with simplicity in mind. It is interpreted, and has a proprietary but extensible library. More – Code Writing scripts more easily. Using Ruby on Rails for Web applications. Tcl A scripting language, easy to learn and available on any platform. More – Code Scripting of portable programs with GUI, and web programming by CGI. NetRexx By IBM, has a simplified syntax. More – Code Extends Java with scripts. Lua Add-on or standalone language with extensible semantic. Lua – Code Extending the C language. Cobol Business language still used on big computers. Cobol – Code Maintaining old programs on mainframes. Fortran One of the first languages, always used for mathematical tasks. Fortran – Code Has huge library for scientific calculations. Lisp Lisp is a very old language designed for artificial intelligence, processes lists only. Lisp – Code Artificial intelligence and scripting. Scheme Scheme is a modernized version of Lisp. Scheme – Code Artificial intelligence and scripting. Prolog For logic programming, based on Horn’s clauses. Prolog – Code Heavy artificial intelligence processing. Haskell Functional programming. Slow and memory consuming. SQL Language of data management. Forth – Code For instrumental commands and legacy libraries re-using. Smalltalk One of the first object oriented language, programs can’t run outside the IDE. Smalltalk – Code Absolutely object-oriented processing. Oberon – Code For nostalgics of the Algol and Pascal time. Caml, Ocalm Functional languages, Ocalm is object-oriented. Caml – Code Used by universities. May help to build a compiler. Scala Procedural, functional and object-oriented programming language. XML Not really a programming language, but may be used for similar tasks. XML XML serves to describe precisely data and may include actions on data. XSL allows to transform documents. great work. nice article. All are true about this. and i love java and c.
Such a work giving so much inspiration to all…. Quiet simple informative list !! This article will first of all explore which kind of workouts you want to to do. After that I will delve straight into what amount of room you might have and just how much you’re prepared to work with. I Am Going To have to visit again when my course load lets up – nonetheless I am getting your Rss feed so i can go through your web blog offline. Cheers. I just want to tell you that I am just new to weblog and really savored this web-site. More than likely I’m likely to bookmark your website . You surely come with superb articles and reviews. Thanks a bunch for sharing your web site.